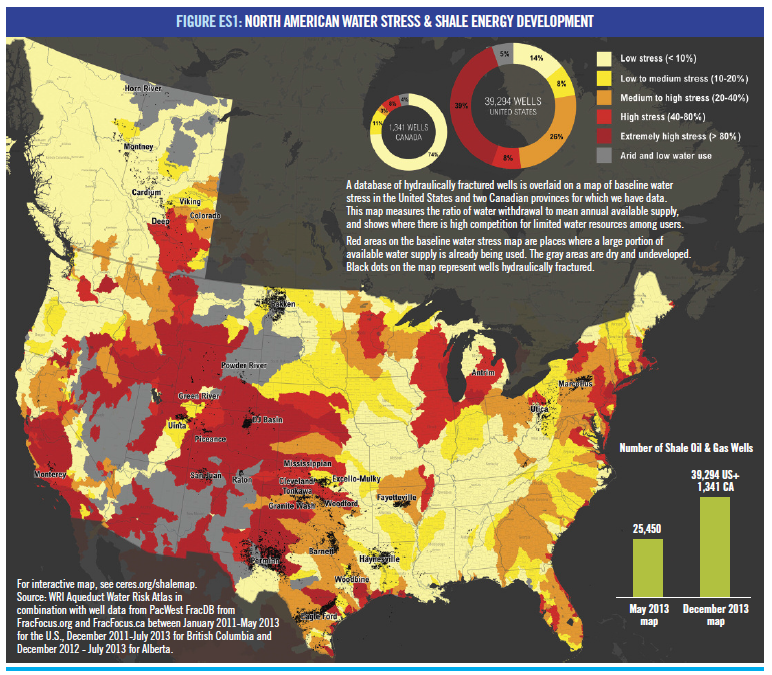 As hydraulic fracturing (fracking) has become commonplace in many states across the country, the problems it creates have become apparent. There’s the noise, inconvenience, traffic (and accompanying accidents, injuries and fatalities), road damage, wildlife disruption, artificial earthquakes, and air pollution that accompany fracking. Worst of all though, is the impact on water – both the large quantities that are used and water contamination. 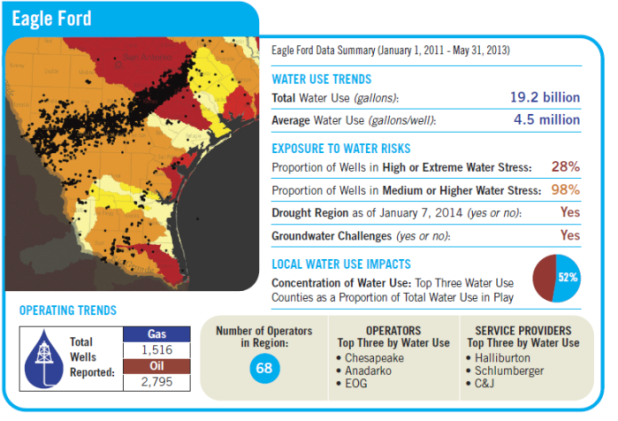 According to a Ceres’ report: “97 billion gallons of water were used, nearly half of it in Texas … [by] 39,294 oil and shale gas wells hydraulically fractured between January 2011 through May 2013”. Texas is more vulnerable than any other state to water depletion from fracking because Texas has the most wells and because much of the state is subject to water shortages. 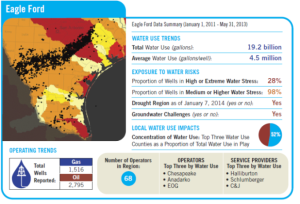 Nearly half of the wells hydraulically fractured since 2011 were in regions with high or extremely high water stress, and over 55 percent were in areas experiencing drought.” Across Texas, multiple shale plays (Barnett, Eagle Ford, Permian, and more) are draining the already diminishing reservoirs. Explicitly for Texas, Ceres states, “Total water use for hydraulic fracturing in 2012 was an estimated 25 billion gallons… expected to reach approximately 40 billion gallons by the 2020s. Where does it all go? That filthy, chemical solution once called water has to go somewhere. Possible contamination is always an imminent danger. Most fracking water does not reenter the water cycle, taking billions of gallons out of the water supply annually. 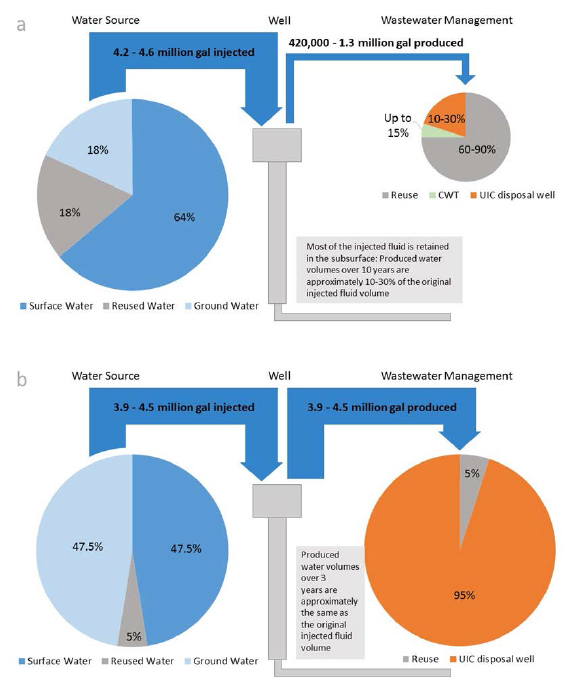 Sometimes wastewater from fracking is sent to central waste treatment facilities, but the Environmental Protection Agency (EPA) found that most of these facilities cannot significantly reduce TDS (totally dissolved solids) or other contaminants. It’s up to well operators to decide whether to reuse the water if it cannot be released into water supplies. Because Pennsylvania limits disposal wells, about 70-90% of Marcellus Shale wastewater is reused. In Texas, only 5% of wastewater is reused, while the other 95% is disposed of in underground injection control (UIC) disposal wells. An injection well, as defined by the EPA, “is a device that places fluid deep underground into porous rock formations…These fluids may be water, wastewater, brine (salt water), or water mixed with chemicals.” So rather than reusing or recycling toxic water, it is shot deep underground into porous rock that could be near any number of water formations. An Environment America report stated that 2010 testing of these wells “revealed that 2,300 failed to meet mechanical integrity requirements established by the EPA”. Beyond that, injection well pressure “may cause underground rock layers to crack, accelerating the migration of wastewater into drinking water”. Fracking is growing a network of toxic waste that is bleeding into our drinking water. Two scientific papers offer impartial evidence of this toxicity. While neither can say with certainty that oil and gas activities are responsible for this contamination (because proving the source of water contamination is very difficult), both rule it as a prominent possibility that requires more monitoring and research for that certainty. The first paper, published by UT Arlington researchers in 2013, provides data from 100 private wells. The authors analyzed the links between contamination, distance, depth, and time in relation to a well. The data showed that concentrations of arsenic, strontium, and selenium (all toxic) were significantly higher in samples from active extraction areas compared to historical data. Concentrations of Arsenic, selenium, strontium, and barium were highest in areas near to natural gas wells. Arsenic, strontium, and barium contamination was highest near to the surface, indicating that this could be due to contact with surface sources, including fracking wells. Another paper by UT Arlington researchers in 2015, examined 550 groundwater samples were taken within the Barnett Shale region. Arsenic, strontium, and beryllium contamination appeared in 10, 9, and 75 samples, respectively. All of these metals present a range of serious health issues. Thirteen of the thirty-nine dangerous, volatile (can easily change between gas and liquid phase, which means they can cause water and air pollution) organic compounds analyzed were found in the region at least once. Certain contaminants were detected more frequently in the counties that have the most oil and gas activity within the Barnett Shale region – Montague, Parker, Tarrant, Wise, and Johnson. Methanol and toluene (both toxic) data showed increasing concentration closer to the surface, meaning the source is more likely surface-based (perhaps from fracking well pads or waste ponds). Dichloromethane is a common and abundant chemical at well pads, and it was detected in 122 samples, 121 of which above the EPA federal limit, and 93% found within the active Barnett Shale region. The same contamination has been discovered in the Permian Basin, and “has also been implicated in air quality contamination events associated with unconventional drilling in Colorado”. Benzene, toluene, ethylbenzene, and xylene (BTEX) are four volatile, organic compounds that also commonly exist in fossil fuels retrieved by fracking. Their composition and volatility make them a major health hazard: benzene is a known carcinogen, and all four have kidney, liver, and blood effects with prolonged exposure (like drinking contaminated water daily). At least one of these compounds was detected in 69% of collected samples, and 10 wells had detectable amounts of all four BTEX compounds. 83% of samples within Montague County (55 of 66) contained a BTEX compound. This area houses underground injection wells for drilling waste disposal across north-central Texas and Oklahoma… Furthermore, this area is also vulnerable to contamination because it occupies the unconfined outcrop zone of the Trinity aquifer. Oil and gas has long been a staple of the Texas economy, but that does not excuse the industry’s reckless depletion of natural resources and contamination of our state. Unacceptable waste and contamination of our water supplies is happening all across the nation – the same water that supports our entire country; the same water used for drinking; the same water that farmers use to feed the country. Once the water is all gone or tainted, the infrastructure of our society will collapse. When an industry is draining the life blood of our land, people, and civilization, it is time for change.